The significantly upgraded Mazda 2 range has gone on sale and now includes an automatic model. Mazda expects the new Mazda 2 automatic to prove so popular, particularly with Motability drivers and driving schools, that it will quickly become one of the best-selling variants of its acclaimed supermini range. The Mazda 2 has always been in demand from those who lease a car through the Motability Scheme and the arrival of the Mazda 2 Automatic will increase this trend. To build on the anticipated sales impetus, the Mazda2 Automatic will feature in Mazda’s special driving school programme, alongside the lower-medium sector Mazda3. The programme is aimed specifically at the 17,000 qualified driving instructors who are self-employed or work for small driving schools across the UK. Anecdotal evidence suggests that many newly qualified drivers go on to purchase either new or second-hand a car similar to the one in which they received driving lessons. The new five-door automatic Mazda2 is badged ‘TS2 Automatic’ and sees a four-speed automatic transmission mated to the 1.5-litre engine, which returns 44.8mpg with CO2 emissions of 146g/km. The model costs £12,370 on the road. The newly launched nine-strong line-up of three-door and five-door Mazda2 hatchbacks costing from £10,305* on the road offers customers a choice of three petrol and one diesel powertrains, and four generous equipment levels. The petrol engine line-up features a 1.3-litre with power outputs of either 75ps or 84ps and a 1.5‑litre 102ps. The diesel engine is a 1.6 litre 95ps. Trim levels are TS, TS2, Tamura and Sport. New features appearing across the entire upgraded Mazda2 range deliver significant improvements to interior comfort, ride quality, handling and refinement. 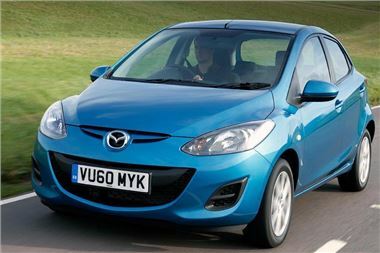 Standard equipment on the Mazda2 range has always been unusually generous for a B-segment supermini. The upgraded line-up means that every model now comes with remote central locking, air-conditioning, electric front windows, electric door mirrors, a piano-black centre stack, CD radio with auxiliary jack and a Thatcham Category 1 alarm. Moving up the range, TS2 models (which include the new automatic) feature 15-inch alloy wheels, side and curtain airbags, leather steering wheel with audio controls, two additional audio speakers, 60/40 split rear seats, trip computer with speed alarm and (on the Automatic) Dynamic Stability Control (DSC).